Plymouth secured a play-off place with a win at promoted Shrewsbury, who missed out on the League Two title. Bobby Reid's neat finish from Kelvin Mellor's right-wing cross gave Argyle the perfect start. And Mellor netted the second from inside the area to confirm a play-off semi-final tie with Wycombe. Even a Shrewsbury win would not have been enough to overhaul Burton, who beat Cambridge, so Micky Mellon's side had to settle for second position. Town lost for only the second time at home this season in League Two, but had already confirmed an immediate return to the third tier with a win at Cheltenham seven days earlier. Match ends, Shrewsbury Town 0, Plymouth Argyle 2. Second Half ends, Shrewsbury Town 0, Plymouth Argyle 2. Corner, Shrewsbury Town. Conceded by Luke McCormick. Attempt saved. Tyrone Barnett (Shrewsbury Town) left footed shot from the centre of the box is saved in the bottom left corner. Corner, Plymouth Argyle. Conceded by Jayson Leutwiler. Attempt saved. Tyler Harvey (Plymouth Argyle) right footed shot from outside the box is saved in the top left corner. Oliver Norburn (Plymouth Argyle) wins a free kick in the attacking half. Attempt saved. 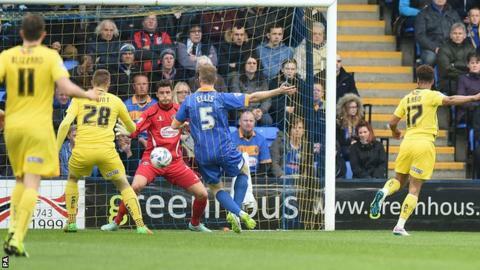 Tyrone Barnett (Shrewsbury Town) header from the centre of the box is saved in the top centre of the goal. Attempt saved. Gethin Jones (Plymouth Argyle) right footed shot from a difficult angle on the left is saved in the bottom left corner. Substitution, Plymouth Argyle. Oliver Norburn replaces Zak Ansah. Gethin Jones (Plymouth Argyle) wins a free kick in the defensive half. Substitution, Plymouth Argyle. Gethin Jones replaces Dominic Blizzard. Substitution, Plymouth Argyle. Tyler Harvey replaces Ryan Brunt. Attempt missed. Scott Vernon (Shrewsbury Town) right footed shot from outside the box is close, but misses to the left from a direct free kick. Anthony O'Connor (Plymouth Argyle) is shown the yellow card. Bobby Grant (Shrewsbury Town) wins a free kick on the left wing. Liam Lawrence (Shrewsbury Town) wins a free kick on the left wing.